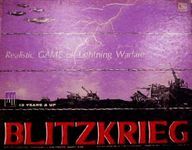 Continuing with my Geeklists of games by some of the early designers of our hobby. I haven't been able to locate any personal information about Larry. Please add some in a comment if you have it. Larry only designed 6 games over a 10 year period, for Avalon Hill and SPI. At least two of them bring back some fond memories for me. Published in 1964, and holds up better than the other early AH games. This game was fairly simple, but was just plain fun. 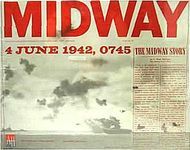 Never tried it double blind, or the expansion, Pacific Theater Via Midway. Didn't matter, had many enjoyable hours with this one. Co-designed with Lindsley Schutz. The first wargame I ever purchased. 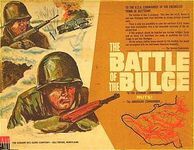 I played Anzio with a friend in 1970 and immediately got an Avalon Hill catalog and ordered this game. I must have played this with every boy in our neighborhood. Had an interesting color choice, as the German counters were pink. Not known for its historical accuracy, yet our games usually resulted in the Germans making a big initial push, with Allied reinforcements eventually turning the tide. Sold in a game purge in the early 90's. BGG lists Tom Shaw as a co-designer, but I've read elsewhere that Shaw was the developer. According to info on the Geek that the game sold 120,000 copies before being dropped from the AH line in 1981. Man, wouldn't current game companies love to sell half that many copies of their games? Also published in 1965, and another game I owned. We didn't play it nearly as often as some of the other AH games though. One, I wanted a game with true history behind it, and second, I seem to recall it suffering from the stalemate issue mentioned by lots of other gamers. Also co-designed with Lindsley Schutz. "Only" sold 27,000 copies, which was considered a commercial failure at the time. I didn't help, as I never owned a copy of this one. Had hidden movement and step reduction. Unfortunately, the step reduction was tracked on paper, and not with counters. The position of hidden Japanese units also had to be tracked on paper. Was this the first game with step reduction? If not, it had to be close to the first. After an 8-year hiatus, Larry came back with this design for the SPI Island Wars quad. I owned this one as well, and used to play it solitaire. I recall enjoying it, but don't recall any details. For nostalgia reasons, it no other, I'd probably pick up a copy if I could get one for a reasonable price or trade. The last game that lists Larry as a designer. Designed with Christopher Allen and Redmond Simonsen. Said to play in close to an hour, which might be reason enough to obtain a copy, as ratings aren't too bad. Part of the West Wall quad. Updated and republished by Decision in 2010.